Part 5 of the ThermIIC series remains unpublished, due to the termination of Archimedes World. However, part of the article transmuted into a piece for Acorn User, which was published in the Christmas 1999 issue. Having a window of numbers and bars is fair enough, but I thought it was time to do something more graphical. 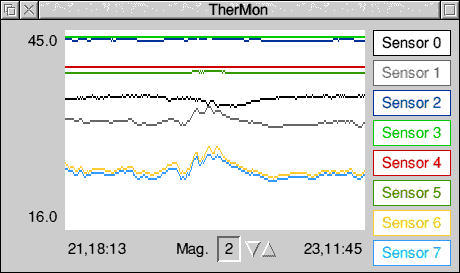 TherMon is a toolbox-based program that gives a live display of data collected by ThermIIC. The data are displayed in 4 magnification steps, from ×1 to ×1000. 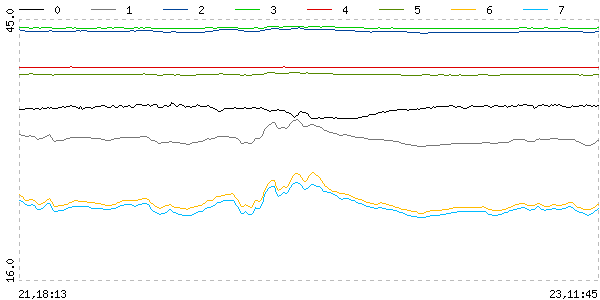 The window grab (below) shows some data at ×100. I used these programs for work, so that my colleagues and I can see how well the temperature control on our telescopes was working. The use of ThermGif was a bit restricted, so I reworked it to take input from CSV files. Since GD dropped gif output in favour of png, this became csv2png. The output looks just the same as from ThermGif, above. Although the program is quite simple-minded, it could be of use for CGI scripts, for example in monitoring applications. I have updated my libraries to use GD 1.8.3. This version has had output to jpeg format added. So for free I have built csv2jpeg, although it's barely worth it, since line plots make for terrible jpeg compression. I've added the facility to specify the date / time format, and lines can be commented-out (with a #). The Makefile is tarted up, with a separate one for Linux, with the source file as csv2png.c rather than c.csv2png. Both distributions contain the binaries and the source, with a sample csv file for testing. Please suggest any patches to me. The GD library itself, together with libpng, zlib and jpeg-6b, is available as RISC OS binaries and header files, to use with your own programs.